Many an attorney will likely attest to having been a party to a conversation with a client who called for help having just agreed to sell their business to someone they knew after receiving an offer over the phone! As the title of this article suggests, the competitive process is aimed at generating competition among many prospective buyers being courted simultaneously in a seller-controlled, professionally-managed strategy. The ability to generate such a competitive process is perhaps the single most valuable tangible benefit of utilizing a licensed and experienced investment bank to take a business to market. The advantages may not only translate into higher valuations, but also into more advantageous terms and conditions, a better controlled timeline, and a matching of corporate cultures. Buyers, on the other hand, favor a negotiated process, or in the jargon of private equity groups – proprietary deals – where, in the absence of competing buyers, prices paid will not reach true market potential. A study done by Dr. John Paglia of Pepperdine University in 2012 shows that the median EBITDA multiple of transactions where an investment banker was not involved was consistently lower than the median EBITDA multiple paid by private equity groups in transactions where investment bankers were involved representing the sellers. Moreover, a study by GF Data Resources of transactions with an enterprise value between $25 million and $50 million found that 68 percent of the EBITDA multiples fell within plus/minus 1.7 times average EBITDA multiple for all transactions in that range. A business with a $10 million EBITDA would hypothetically see offers ranging from $17 million less than the average to $17 million more than the average of the offers received: a $34 million swing! 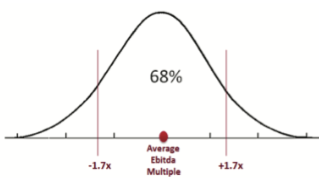 And this does not take into account the possible outliers that, as a result of different strategic considerations, might value the target at even higher multiples. These are clearly not scenarios that are likely to emerge from a negotiation with a single buyer. At the opposite end of the spectrum is the auction process where a large number of prospective buyers are approached simultaneously. This approach involves a homogeneous presentation to all potential buyers normally consisting of a Blind Business Profile to entice the interest of prospective buyers without disclosing the seller’s identity, a Confidential Information Memorandum that select prospects receive upon signing a Confidentiality Agreement, and a virtual data room where the same information is made available to all bidders. A rigid timeline and process is maintained to keep buyers moving forward and submitting offers at given times. Auctions are also recommended when it is possible to create precise specifications of the assets being sold so that all bidders have a similar understanding of the target of their bids. Likewise, when speed matters, an auction process will be the preferred approach. There are drawbacks to the auction process – with a large number of prospects and a more widespread dissemination of confidential information, it may be more difficult to maintain secrecy. Also, a lower than expected buyer turnout or price bid can be damaging to the selling company’s standing moving forward, regardless of whether a transaction is completed at the end of the process. In his book “Dealmaking – The New Strategy of Negotiations,” Subramanian discusses a hybrid approach to dealmaking. Similar to an auction at its early stages, the negotiauction approach evolves to incorporate one-on-one negotiations with a select number of prospective buyers at the latter stages of the process. In essence, this is no different from the approach adopted when, for instance, selecting a contractor to do a renovation. Several companies are pre-selected on the basis of their experience and personal recommendations, and each is asked to submit a proposal. Then, there are further discussions and negotiations with the few that seemed better able to do the job. Price might be an important factor, but quality of the work, time required to finish the job, professionalism of the workers, and other aspects will likely also be considered before a final decision is made. As in an auction process, a negotiauction demands careful preparation. Here too, a large and diverse number of potential buyers must be identified and contacted. Based on their reaction to a professionally drafted Blind Business Profile, those with an inclination to proceed must sign a Confidentiality Agreement before they can receive the Confidential Information Memorandum, CIM, which contains a more comprehensive and detailed description of the business’ financial history and projections, operations, human and technical resources, and market characteristics and opportunities, among other aspects. From the review of the CIM, questions will arise that must be promptly and accurately addressed. At this stage additional screening can be done by requesting those prospects who want to move forward to submit a written Expression of Interest with a non-binding, rough estimate of value and terms. This key component of a well-managed competitive process will help sort out low bidders while inducing the others to up their ante and match the highest bidders if they want to remain in the game. It is at this stage where the initial negotiations of the negotiauction process occur. Then there are site visits and personal meetings between seller and prospective buyers where parties have a chance to assess less objective, though important, components of a decision to move forward such as a match in corporate culture, personality, and leadership style of the future partners in the case of a partial sale, and others. Subsequent negotiations will lead to one or more parties presenting a Letter of Intent or LOI, a more detailed, though still non-binding, offer. It is important to note that the seller’s highest leverage point in the negotiation will be right before executing an LOI, by virtue of which the buyer will enjoy a negotiated exclusivity period. Due diligence follows the acceptance of an offer. This is a period marked by the buyer’s increasingly intense scrutiny of all aspects of the seller’s business, information exchange, and the negotiation of a definitive purchase agreement and associated documents that will govern the final terms and conditions of the transaction at closing. Evidence has consistently and repeatedly supported the merits of a competitive process in the sale of a business. As indicated above, specific market, industry, or business conditions may suggest different approaches to a competitive process. But whether a true and fully transparent auction is utilized, or a mix of approaches is preferred as in a controlled negotiauction option, the seller will be better able to realize a higher value and better terms if they stay away from “negotiating” a deal with a single buyer. Roy Graham and Eduardo Berdegué are Managing Directors of the San Antonio/Austin office of Corporate Finance Associates. CFA is a middle-market investment banking firm specializing in assisting business owners and corporations seeking to buy or sell a business, or recapitalize their companies. CFA also has Texas offices in Dallas, Houston, and Midland. www.cfaw.com.